GET HER BREED TO A CHAMP HERDSIRE FREE! Midnight Moon @ R&R Suris began as The Midnight Moon Alpaca Ranch in August 2008. Our recent success has been made possible by a unique collaboration that started several years ago with R&R Suris of Montague, Michigan, owners Doug and Julie Rice. There were several obvious factors that naturally drew these two farms together—a love of working with Suri alpacas, creating an eco-friendly environment and a motivation to succeed in an industry that has seen a bit of a shake-out over the last few years. Both farms strongly believe that, to be successful as a small alpaca operation, there needs to be something unique about your offerings. A combination of the best resources from both farms allows us not only to provide customers with the most sought after Suri genetics but also with expert advice on being successful as a small start-up alpaca business. Our “foundation Suri team” is the result of having purchased some of the greatest Accoyo bloodlines from the original imports as well as Suris with proven track records of producing award winning offspring. These include; Abel, Angel, Belmonte, Chakotah, Condor, Diamonte, Inca, Jackpot, Juan, Kalvin, Kahuna, MacGyver, Miguel,Rockstar, Ramilo, Shavano, Torbio and Uribe. This positions us to be flexible to meet the unique needs of our customers with many breeding combinations. Thus our slogan…SMALL FARMS—BIG GENETICS! R&R Suris is located in Western Michigan, just miles from beautiful White Lake & Lake Michigan beaches on 200 acres of family owned property. Midnight Moon @ R&R Suris is more than happy to work out a convenient payment schedule on any one of our alpacas listed. Typcially, with 20% down, we can carry payments out for 12 months with 0% interest. If that does not match your needs, let us know what will be the best for you---we are flexible! WHO OR WHAT IS AN ELECTROFYRE'S COSMIC DUST? It may sound like something from Star Wars. However, to Suri Alpaca GEEKS, me included, Electrofyre gets our attention very quickly! Midnight Moon Suris is proud to announce our ownership of Electrofyre's Cosmic Dust, 2016 and 2017 AOA National Supreme Champion Suri Light Male. Cosmo is permanently moved Northward to our "Field Office" at R&R Suris, Montague, MI. In addition those titles, Cosmo was also awarded The JUDGE' S CHOICE at 2017 MAPACA plus TEN COLOR CHAMPIONSHIPS as well as FIFTEEN BLUES during his show career. We are excited to see Cosmo's first cria on the ground in SU 19. Cosmo was breed to SPAR's Bang Bang, 6X Champ as well as a Futurity winner in her own right. Her 2017 Cria, our own Chocolate Moon "Chaco" was a 5X Color Champion as well as 10 Blue Ribbon Winner! 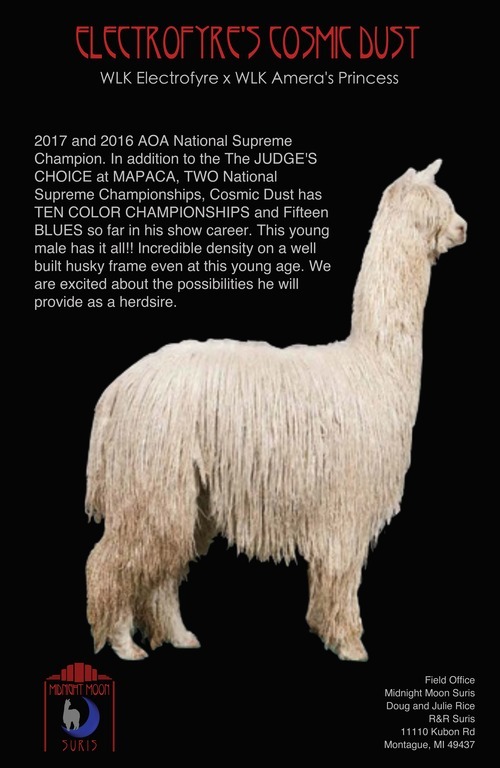 We can only IMAGINE what the combination of Cosmo and Bang, Bang's genetics will be in this 2019 cria will as well how many CHAMPIONSHIPS it will bring home from the show ring in 2020! If Dad, Mom and 1/2 Brother are any indications. LOTS!